More than 20 years ago Deborah Bourque of Northborough, Mass. decided to sponsor a child in hardship through a non-governmental organization called the ChildFund. She was assigned to be a sponsor for a second grader Momodou Bah from the Gambia. For the next several years she was donating monthly a little more than $20 so he could receive education, until the boy finished high school and they’ve lost contact. The boy grew up and at the age of 22 became the Gambia’s youngest elected ward councilor (a position similar to a county supervisor), representing eight villages. Among other initiatives and responsibilities, he also set off on to a large reforestation project in his county – replanting mangrove trees with a goal of 1 million new trees by the end of 2017. Moreover, this year at the age of 30, Momodou was chosen among 500 from 50,000 applicants for a Mandela Washington Fellowship for Young African Leaders, the flagship program of President Obama’s Young African Leaders Initiative (YALI). Thus, Momodou was able to come to the United States for the first time to take courses for six weeks in political and civic leadership at Virginia Commonwealth University in Richmond, VA. He also visited Washington D.C. for a three-day Presidential summit featuring a town hall with President Obama, networking and panel discussions with U.S. leaders from the public, private, and non-profit sectors. Nevertheless, one of his priorities was to find Deborah. Since all their communication was once managed through the ChildFund, he didn’t have her address. So he just walked into the headquarters of the ChildFund in Richmond, VA, taking the staff by surprise. He still remembered all his reference numbers from years in the programs and could prove his identity. The ChildFund put him in contact with Deborah Bourque and on August 8, 2015 they met for the first time. The photographs below document their meeting. I was honored to photograph them for the ChildFund since it is very inspiring to see the real example of how one-on-one sponsoring can make a huge difference in the life of a child and bring so much value to his or her community in the future. I was touched to hear from Deborah that both she and Momodou thought that even if one person would decide to sponsor a child after hearing their story, then their mission would be accomplished. Deborah Bourque receives a call from Momodou M. Bah while waiting with her daughter Natalie for his arrival at their home in Northborough, MA on August 8, 2015. Deborah Bourque of Northborough, MA goes through the letters she received from Momodou M. Bah while sponsoring him as a child through the ChildFund before his visit on August 8, 2015. Deborah Bourque of Northborough, MA shows one of the photographs that she received from Momodou M. Bah while sponsoring him as a child through the ChildFund before his visit on August 8, 2015. Deborah Bourque of Northborough, MA shows her daugther Natalie letters that she received over the years of sponsoring Momodou M. Bah as a child through the ChildFund before his visit on August 8, 2015. A family picture that Deborah Bourque received from Momodou M. Bah while sponsoring him as a child through the ChildFund lays on her kitchen island in her house in Northborough, MA on August 8, 2015. Deborah Bourque of Northborough, MA reacts to the arrival of Momodou M. Bah of the Gambia, whom she sponsored as a child through the ChildFund more than 20 years ago and who travelled to see her for the first time on August 8, 2015. Momodou M. Bah of the Gambia accompanied by his sister Sunkaru Bah meets Deborah Bourque, who sponsored him as a child through the ChildFund more than 20 years ago, for the first time in her house in Northborough, MA on August 8, 2015. Natalie Bourque meets Momodou M. Bah whom her mother sponsored as a child more than 20 years ago through the ChildFund at their home in Northborough, MA on August 8, 2015. Deborah Bourque of Northborough, MA shows the dress that Momodou M. Bah of the Gambia brought for her from Africa on August 8, 2015. 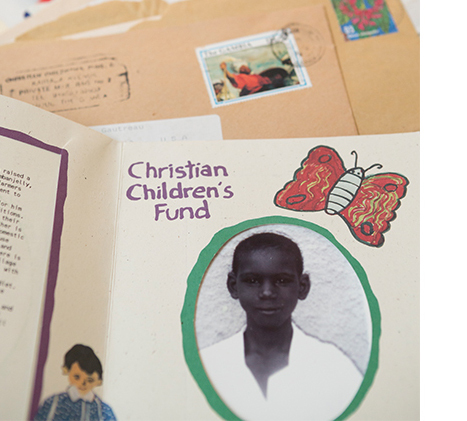 Deborah Bourque had been sponsoring him as a child throug the ChildFund for several years. Momodou M. Bah of the Gambia looks through the old letters he sent to Deborah Bourque while she was sponsoring him as a child through the ChildFund at her house in Northborough, MA on August 8, 2015. Deborah Bourque of Northborough, MA shows Momodou M. Bah of the Gambia pictures he sent her while she was sponsoring him as a child through the ChildFund at her house in Northborough, MA on August 8, 2015. Deborah Bourque of Northborough, MA and Momodou M. Bah of the Gambia look at a hand made card he sent her while she was sponsoring him as a child through the ChildFund at her house in Northborough, MA on August 8, 2015. Momodou M. Bah of the Gambia looks through the old letters that he sent to Deborah Bourque as well as his Progress Reports and other papers that the ChildFund sent her while she was sponsoring Momodou as a child (Northborough, MA on August 8, 2015). Momodou M. Bah of the Gambia and his sister Sunkaru Bah spend time with Deborah and Paul Bourque and their kids Natalie and Jack at their house in Northborough, MA on August 8, 2015. Momodou M. Bah of the Gambia meets Deborah Bourque's neighbor in Northborough, MA on August 8, 2015. Deborah Bourqe was sponsoring Momodou M. Bah as a child for several years about 20 years ago through the ChildFund. On August 8, 2015 he came to see her for the first time. Momodou M. Bah of the Gambia and Deborah Bourque of Northborough, MA pose for a portrait together on August 8, 2015.